Last week I got to go on a trip with the pawents. 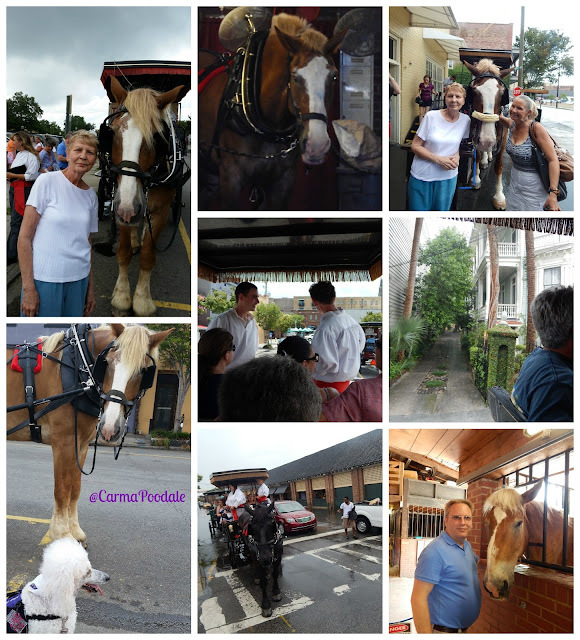 We went to Charleston, South Carolina for dad's family reunion. 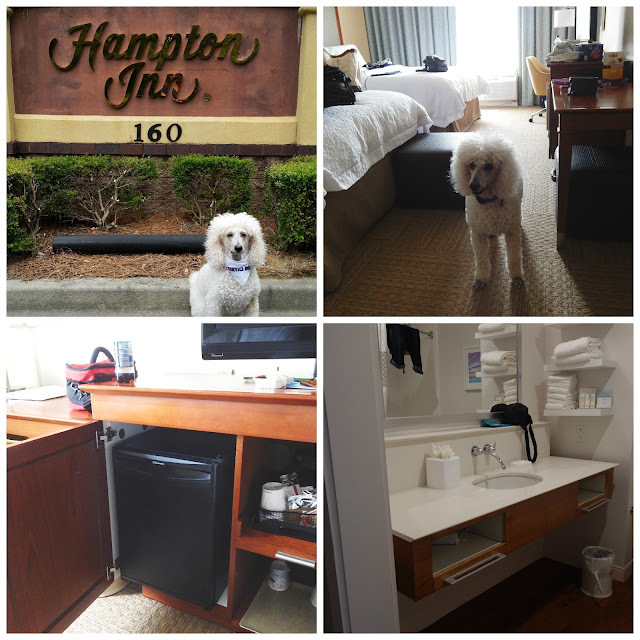 The hotel we stayed in was the Hampton Inn on Daniel Island. Unfortunately, it's not a pet friendly hotel but I am a medical alert service dog. The drive was really long. I think ma said it was almost 10 hours. We spent the night in Clinton, SC. Its a couple hours away from our destination. After a good night sleep we headed to Charleston. We arrived a little early and since our room wasn't ready we headed out to see the sights. We made our way to the beach. I have always wanted to go to this thing called a beach. Ma has said many times she wanted to let me run the beach. I have a a big sand lot in my yard where our pool used to be. I sure love to run through it and kick that sand up as high as I can! Ma said she wanted me to run a REAL beach. Running on the beach is on my Bucket List. When we got there, we found a spot to park and started walking down the path. That path was nothing like I have ever walked before. Its was sandy! When the path ended all I seen was lots and lots of sand! I looked out and the sand ended and there was soooo much water. Water, water everywhere!! I didn't see where the water ended. That was the biggest lake I have ever seen! We went to Island of the Palms to see the ocean. Ma said it was the OCEAN! That beach was really great. It was so great that we went 2 days in a row! I could be easily be a beach poodle. Yep, Carma the beach bum. On the 2nd day the sun was out, ma made me a tent with some towels so I wouldn't get too much sun and she took my collapsible bowl and filled it with fresh bottle water. She had to keep a towel over it so the sand didn't blow in it. I sure loved people watching and when I got hot I got back in the water. It was fun racing the water before the waves could get me. That night we heard on the news about someone getting bit by a shark in the area that we were. Glad sharks didn't come around when we were there! After we had some beach time, the pawents decided to check out Charleston. We walked around a bit and then they decided it was time to eat. 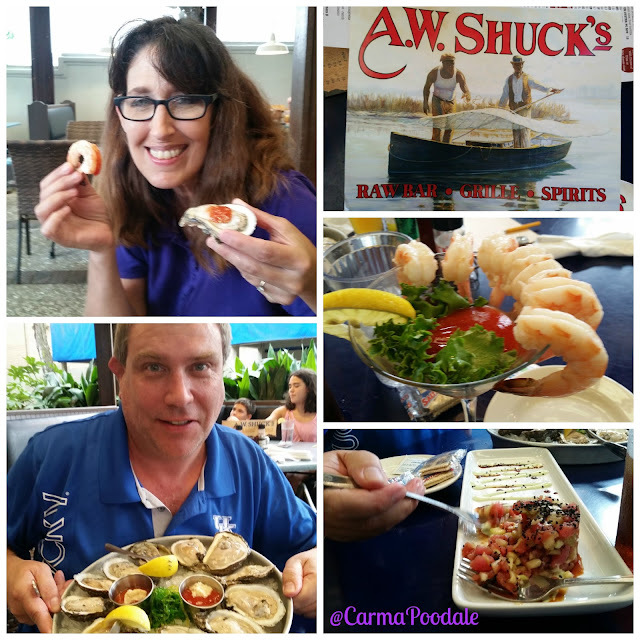 We went to A.W.Shucks on Market Street. Its a seafood restaurant and oyster bar. The waitress started to take us to the canine patio ,ma told them I was a service dog. They seated us on the patio and brought me a bowl of water. I refused the water and took a nap instead while the pawents ate. I was one worn out pup. We went back to the hotel and caught up with the rest of the family that had arrived. After a good night sleep, the pawents had breakfast with the family. Ma was happy that she could make her own waffles. The hotel provided guest with free wifi and breakfast every morning. We went to Market St again with all the family. While we were walking around, Ma seen a sign and her face lit up with the biggest smile. I looked around and seen what was making her smile. You know we never went INSIDE this store?! We took a carriage tour later that day. It was a great way to learn more about the city and its history. We learned about why their were so many pineapple statues in town. The legend stems back to the colonial days when Charleston was much more of a shipping city. When a sea captain returned home from a long voyage he would have precious, exotic souvenirs of his voyage. The captain would spear a pineapple on his fence post to let his friends and neighbors know that he had returned safely. It started raining while we were on our tour. Then it started storming! Thunder, lightning and a huge downpour. We got soaked. We had to keep going because there were horses behind us and our tour guides said they were not allowed to let us off the ride. That thunder was so loud. Ma was sitting on the end of the seat and she was drenched. The people sitting behind us got the worse of it. Everytime the horse stopped for a stop sign, the water that was on top of the carriage cover would pour off. Too bad it would pour off on the people sitting on the back seat. 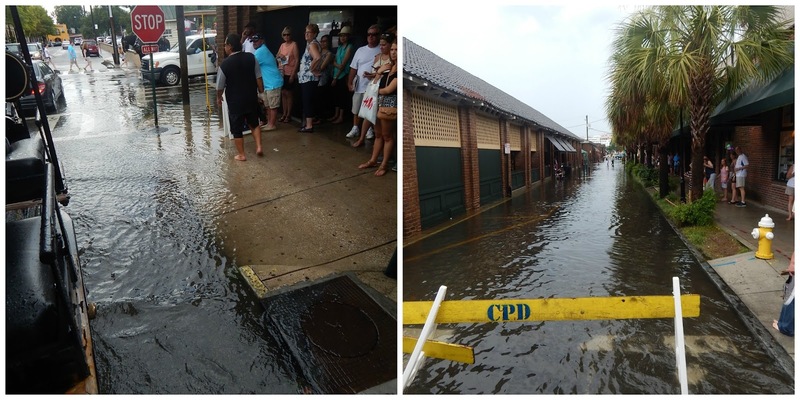 The streets of Charleston flood. The water was past ma's ankles. Maybe that is why we seen so many people wearing flip flops. It took a little while but the water drained away. Ma and I got separated from our group of relatives because ma was emptying her purse out. It was full of water. She was afraid all the electronics we had would be ruined but they weren't. Thank dog. But dad sure got in trouble when ma seen him again. I was super excited when I found this place. Yep, it was the House of Jerky! They had all types of jerky. Alligator, shark, swordfish, kangaroo, turkey, beef, peppered, teriyaki, you name it , they had it. Ma got me a bag of plain beef jerky. A 2 oz bag was $6! 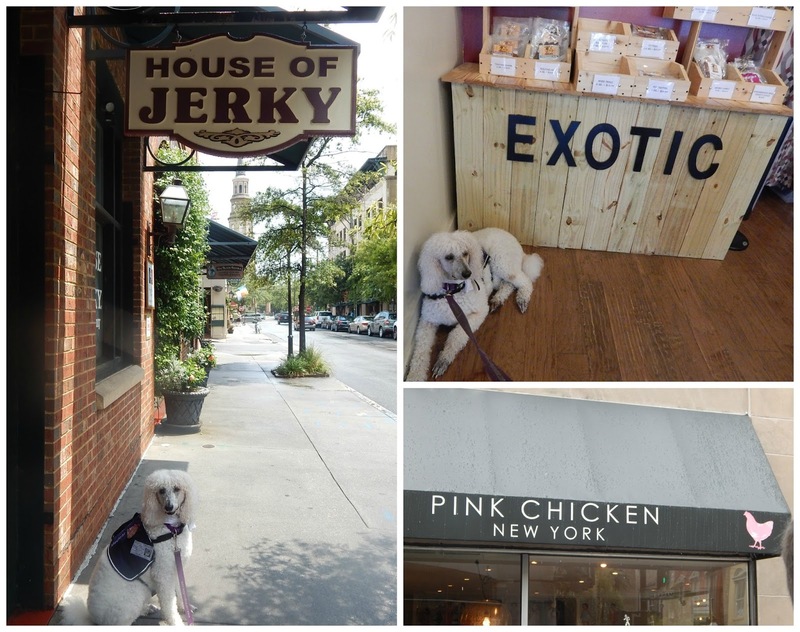 The exotic jerky was $18-$20 for a tiny bag. That is a lot of milk bone money!! I seen this store called the Pink Chicken. I thought about my friend, Flea. We didn't do much shopping or visit many stores because ma wasn't feeling to good and walking wasn't easy. We had visited so many other places and did so much walking that she was wearing down. We didn't bring her walker when we were downtown because there was no room for it on the shuttle and it was so crowded downtown. The funerals for those who were shot in the church were being held. It was located right near where we were. There was also a Carnival Fantasy Cruise ship parked at the dock. Those ships are super big! There were so many people that you could barely move around. On Sunday we headed home. We drove straight home. All in all we had a good time. I heard the pawents saying the next time they go somewhere over 7 hours away, they would be flying. I agree! I like to fly. Have you ever been to Charleston? How about the ocean? I would love to know. I have never been to Charleston and have always wanted to go. Looks lovely even with the rain! Glad you had a great time. I have never been to Charleston but thanks to you and these fun photos and descriptions, I feel as if I have been there! I would LOVE those restaurants, and that photo of your Mom yelling for an RC Cola was just too darned funny!!!! Looks like you all had a blast at the beach. I don't know what happened to the poodle gene in Sam, he'd avoid the water at all costs! Looks like it was a great trip. It sounds like a grand adventure!! Too bad about the flooding though, I think I'd be super upset to have to stay on that carriage. Wow! That certainly looks like a wonderful trip! I've never been to Charleston, but I'd love to visit sometime! 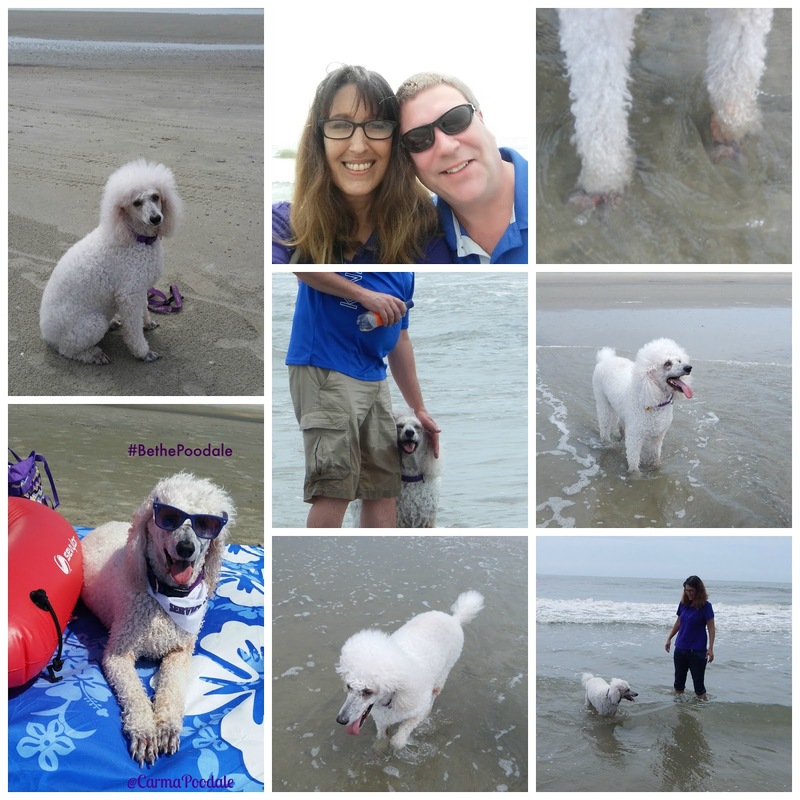 Glad you got to see the beach too! Luna loved to dig in the sand the last time we went to the beach. 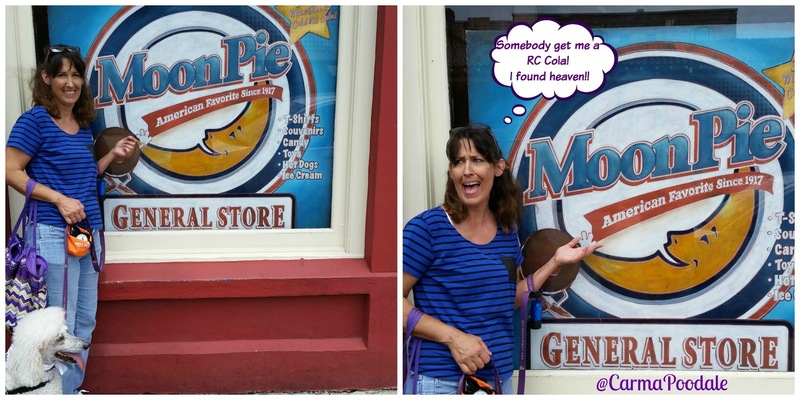 I do LOVE me a good Moon Pie!